Our boys adore scones (even if they still can’t say it) and with all the excitement in the kitchen you would think some fabulous dessert was in the works instead of simple gingerbread scones for breakfast. After the scones had cooled a little I arranged them on the plate, leaving one for the boys to share while I quickly took a few photos. The flavor of these is such a delight that there wasn’t a single crumb left after breakfast and Michael asked me to make a double batch next time. 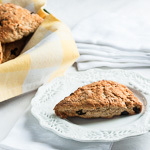 This particular recipe uses some whole wheat flour, making the scones a little more substantial rather than delicate, but that’s a plus for us. 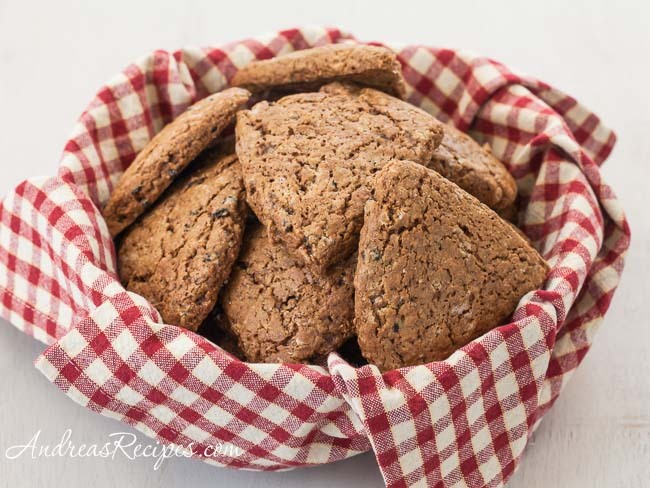 They are flavored with molasses, crystallized ginger, and gingerbread spices. The cloves and nutmeg are my addition as I just couldn’t imagine gingerbread scones without them. The scones are easy enough to whip up on Christmas morning or you can make them the night before. If your house is anything like ours, getting the boys to stop and eat amid a flurry of wrapping paper excitement is almost impossible, but these just might tempt them. Place oven rack in the middle and preheat oven to 375° F/190° C.
In the bowl of the food processor, add the all-purpose flour, whole wheat flour, brown sugar, baking powder, baking soda, ground ginger, cinnamon, nutmeg, cloves, and salt. Pulse a few times. Add the cold butter pieces and pulse about 12 to 15 times until the mixture resembles coarse crumbs. Pour into the mixing bowl and stir in currants and crystallized ginger. Make a well in the center of the mixture. Bake in the preheated oven 12 to 15 minutes, or until a wood toothpick inserted into a crack in top of scones comes out clean. Serve warm or at room temperature. Makes 12 scones. Cool scones completely and wrap in a single layer in foil, then place in a freezer bag. Freeze for up to 1 month. To serve, remove from freezer bag. Place frozen, foil-wrapped scones in a 300° F/150° C oven and heat for 20 minutes or until warm (12 minutes, if thawed). 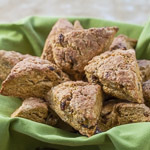 Your scones look and sound fantastic! I love ginger-y things. Haven’t made gingerbread in an age; might have to try these this week . . . 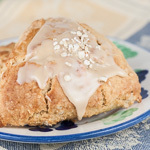 I love the idea of gingerbread scones. So perfect for the holidays with a cup of chai. Wishing you and your beautiful family a safe, healthy and happy holiday! Very original! I bet they taste divine! Wish I had one (or two…) of these treats with my afternoon tea. Love all of these spices and the crystallized ginger. Oh yum, I loooove gingerbread scones! Gingerbread scone are too yummy.. I used to spread Patn ghee on it make them more delicious..